The AquaThruster by Weeders Digest is the most effective tool to help protect, clean & maintain your shoreline & beach. This multi-purpose lake shore management tool will meet, or exceed your expectations when used properly. 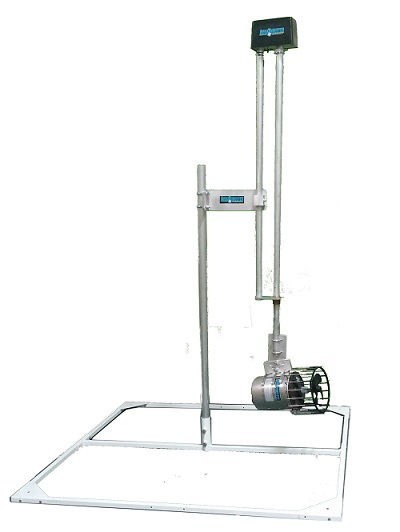 The Aqua Thruster has many benefits and has one of the highest satisfaction rates among our customers. It can clear, remove, prevent and get rid of everything from muck, lake weeds, algae, leaves, twigs and many other kinds of debris on the bottom, and on the surface. The Oscillator can be set to rotate as much or as little as needed (0-360 degrees). This powerful machine is capable of clearing as much as a 175 foot diameter area from one spot depending on the model. Guaranteed to drastically improve your shoreline in as little as a few days. All components are UL listed and UL approved. Includes two-year warranty by Weeders Digest. Available in 110 or 220 Volt options. 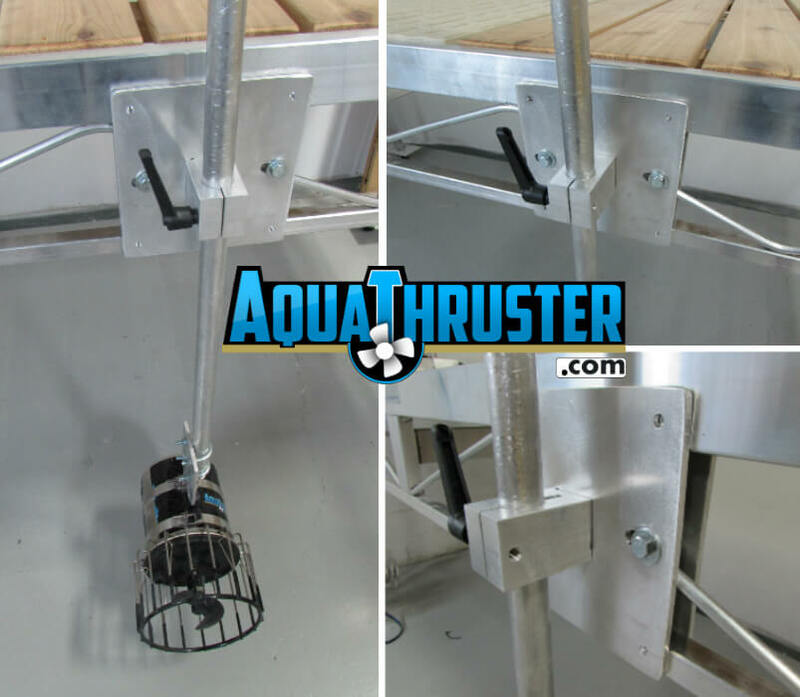 The AquaThruster comes in a variety of HP models and mounting options to fit any application. See below to learn more about all of these options to determine which option will be idea for your application. If you still have questions or would like some assistance regarding mounting and horsepower options - feel free to give us a call or use our live chat feature. Once we know the specifics of your shoreline and current situation, we will quickly be able to advise you on the best, most effective options. Choosing the right size Aqua Thruster blower motor depends on what you're trying to accomplish, how large of an area do you want clear, and how much muck, sludge, leaves or debris you have on the bottom of your lake front. The diagram below is designed to give you a general idea of how the thrust power differs between each HP motor options. NOTE: An Overview Video of these mounting options is located near the bottom of the page! This option allows you to easily install a dock plate to any part of your dock using a few bolts. This is a “semi-permanent” option for those who have no need to move their unit around their dock or shoreline. 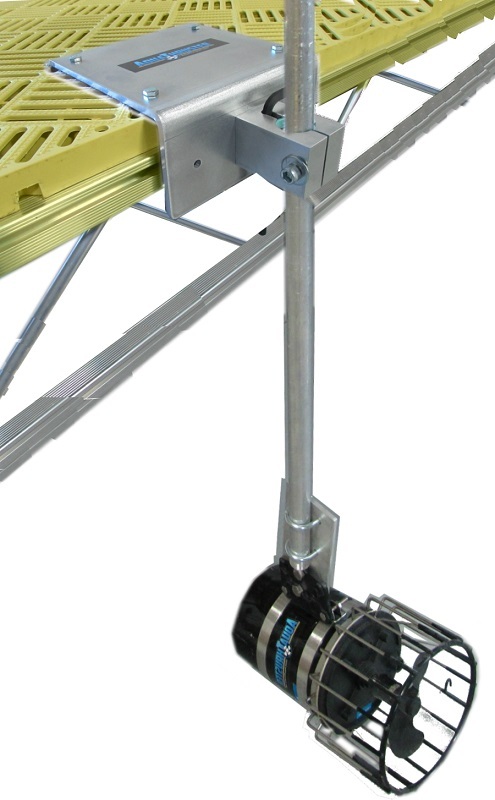 The Aqua Thruster unit can easily be removed from the mount for easy storing. If your dock has posts, this mount makes it extremely easy to mount on any post along your dock to allow maximum coverage of your beach. It is quick and easy to attach and remove so portability won’t be an issue. Easy to move from post to post as needed! To mount, simply slide the Portable Dock Post Mount over the desired dock post, tighten a couple bolts and you are ready go! To move or relocate, just loosen the bolts, slide it off and repeat! Fits square and round dock posts up to 4" wide. This is a great option if you don't have a dock or want to locate your AquaThruster in areas away from your dock. This option allows you to manage more area as it can be moved and relocated along the shoreline as needed. 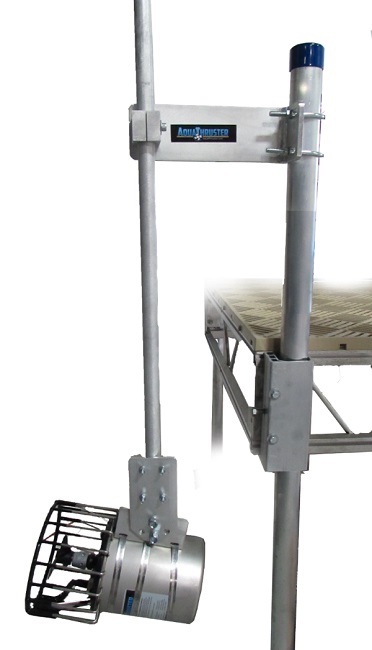 This "sandwich style" mount attaches to the side of any truss style dock. It can be moved anywhere around your dock very easily so you can cover more area effectively. Mounts on any part of your dock in less than 2 minutes! Completely Automate your short journey to a solid bottom beach. Program to cover only the areas you want! It will do the rotating for you! The Oscillator comes standard with the Dock Plate Mount but is also compatible with every other mounting option with the exception of the Float Mount. The float option is ideal if you don’t have a dock/pier and want to blast algae and floating debris as the Aqua Thruster sits two feet below the float. The float option for the Aqua Thruster works by allowing you to tie the system to something on the bank. The Portable Bottom Frame mount enables you to use your 360 degree oscillator without mounting to a dock! Disclaimer: Some states may have regulations regarding methods that moves or removes the lake bottom. You may want to contact your local representative for information on possible regulations in your area. Q. Is it Illegal to own or operate the AquaThruster in the state of Minnesota? Q. Are you only an online store or do you have a storefront? A. We have a storefront too! We have over 7000 sq feet loaded with everything imaginable for your waterfront. A. We are located in New Hope, Minnesota (Twin Cities Metro Area). Q. Do you offer special volume pricing? A. Yes! Call us and learn more about what constitutes a volume order. How to get rid of lake muck, weeds, leaves, twigs, algae and scum? 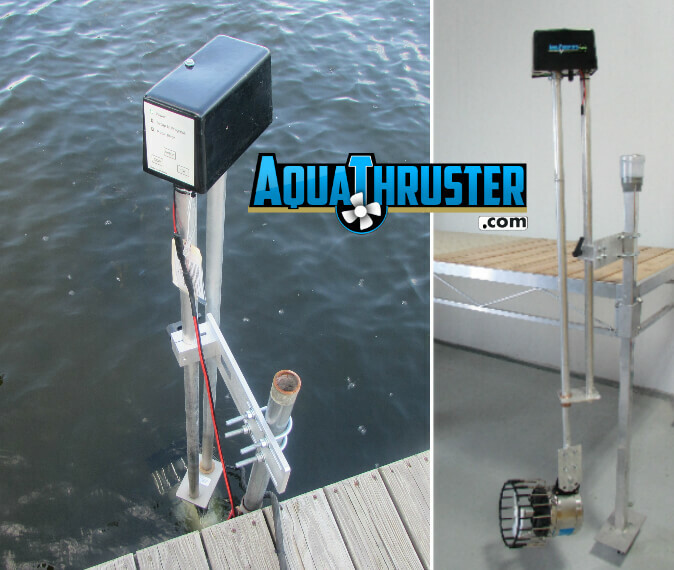 As you may already know, The Aqua Thruster by Weeders Digest offers the best solutions for removing and preventing lake muck on your lake front. The Aqua Thruster is our first choice especially when our customers want something that will resolve their muck, silt, aqutic seaweed and floating algae issue FAST! We have so many options for size and mounting options to perform well in nearly any application. After years of continually improving and perfecting every aspect of the AquaThruster. Weeders Digest is confident that this product will drastically improve your shoreline and guarantees customer satisfaction. It is also the perfect tool for maintaining a sandy, hard bottom beach and protecting your shoreline from weeds & algae that tend to float in. 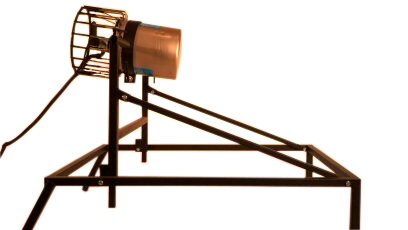 The Dock mount, Post mount & Side Truss Mount options for the Aqua Thruster is adjustable up to a 5 foot water depth so you can use it for blasting and moving lake muck and sediment by positioning close to the muck bottom. You can also raise it to just below the water surface to maintain a floating weed and algae area. You can add the 360 degree oscillating motor to your Aquathruster to maximize up to a 360 degree coverage area! The oscillating motor is a fantastic convenience tool because it enables you to mount your Aqua thruster in one dock location so you don't have to reposition. Aqua Thruster | Customer Testimonial / Review | Weeders Digest. Could not be happier. Works incredibly well. We have 70 feet of lake front and it only took a few days to rid of the muck. One suggestion. If you have deep muck buy a weed rake to agitate the muck, it helps the thruster move the muck quicker. I am amazed at how well this works. I purchased the 1 hp model and it moves a lot of water. immediately we watched as silt on the bottom and algea on the top were moved out. I am very happy with this product. wish I had bought it years ago. The 1/2 hp model is more than expected. It is very powerful and once a current is established, it will clear out much more than it's rated area. Great Product! Worth every penny. Cleaned up the muck and bottom trash in no time. Within one day could see a difference. After one week sand bottom appeared and shoreline and swimming area are in excellent condition. My five tear old grandson said it's like being on the sand bar grandpa. Would recommend to anyone with weed and silt problems. Bought the rotator to sweep 180 degrees and works as described. Put the timer that comes with it and run it 4 times a day for 2 hours . Very impressed. After researching for months what to do to keep my dock area clean, I took a risk with the aqua thruster. I bought the oscillation along with it to really find out what the device could do. Honestly, the $2k is WELL WORTH the investment! The water movement has cause no weeds to grow, reduced inches and inches of muck (within a week) and even fishing has been amazing! The water movement is like a calm river , which arerates the water giving more oxygen to the lake. I felt it was my duty to leave a review for how satisfied I am. After years and years of weeds and muck buildup overtaking the area around my dock, I thought there was no hope. After just a few days of using the Aqua Thruster, the muck was gone and all that remained was sand and rocks. We can now fish from the dock and the motors are not getting all choked up with weeds. I cannot wait to see how everything looks after using it for a longer period of time! I have only had my Aqua Thruster for a short time, but during this time the unit has exceeded my expectations. My dock location allowed for very little water flowage. This has all changed now resulting in clearer water and less shore maintenance on my part. My only regret is that I didn't buy one sooner. Made a huge difference in clearing the weeds, muck and surface junk (duck weed, algae, etc.) I can actually SEE the bottom of the lake off my dock now! It also got rid of the smell. The only way we would go swimming in the past is load everyone up in the boat and go out to the middle of the lake. Now we can swim off our shore and dock. Aqua Thruster works as advertised. Well worth the money! Where has this product been??? I wish I had taken before and after pics to show what this has done over the few weeks I have had it. For years we have been fighting debris and on our lake shore. Not anymore! We are also seeing the weeds and muck starting to move out and we can actually see the lake bottom. I have been searching for solutions for years and was fortunate to run across the Aqua Thruster website. Glad I found it. Plus the staff were great in helping to determine what I needed to meet my needs. Seems to do a good job! Once mucky swim area is now sandy and inviting. The increased real estate value more than covers the cost of this rugged, well built machine. People at Weedersdigest will are friendly and enthusiastic and will take as much time as you need to answer your questions. My only gripe is that I didn't pull the trigger sooner.